50. Dermot Kennedy - "Glory"
49. Beck - "Dear Life"
48. Ed Sheeran - "Supermarket Flowers"
47. Lana Del Rey - "Love"
46. Rationale - "Prodigal Son"
45. Peter Bradley Adams - "My Arms Were Always Around You"
44. Harry Styles - "Sign of the Times"
43. LCD Soundsystem - "how do you sleep?" 42. Foster the People - "Pay the Man"
41. Calvin Harris ft. Frank Ocean & Migos - "Slide"
40. Sufjan Stevens - "Mystery of Love"
39. Fleet Foxes - "Third of May/Odaigahara"
38. Pond - "Sweep Me Off My Feet"
37. WALK THE MOON - "Tiger Teeth"
36. MuteMath - "Everything's New"
35. Elbow - "Magnificent (She Says)"
34. Sylvan Esso - "Radio"
33. Coldplay - "A L I E N S"
32. Spoon - "Hot Thoughts"
30. Violents & Monica Martin - "Awake and Pretty Much Sober"
29. Grizzly Bear - "Mourning Sound"
28. Passion Pit - "Hey K"
27. Fleet Foxes - "Fool's Errand"
26. Yellow House - "Better Views"
25. The Killers - "Rut"
24. The National - "Day I Die"
23. Cold War Kids - "Can We Hang On?" 22. Arcade Fire - "Everything Now"
21. Radiohead - "I Promise"
20. The War on Drugs - "Pain"
19. Andrew McMahon in the Wilderness - "Birthday Song"
18. Portugal. The Man - "Feel It Still"
17. Toro Y Moi - "You & I"
16. Tame Impala - "List of People (To Try and Forget About)"
15. Fleet Foxes - "Naiads, Cassadies"
14. Sufjan Stevens - "Tonya Harding (In D Major)"
13. Minus the Bear - "Silver"
12. The Shins - "The Fear"
11. Rayland Baxter - "Yellow Eyes"
Do you miss what MGMT was supposed to be? “Paint Me Silver” is the best of three outstanding tracks by the Australian psychedelic rock band. “Can I Sit Next to You” is a classically classic Spoon song: tightly produced, a little funky, and Britt Daniel’s raspy growl. This is a summer with the windows down song. Six years ago Drake released a slow, dark, heartfelt track called “Doin’ It Wrong” with Stevie Wonder on harmonica, and for six years it’s been one of my favorite songs in my collection. Along with other more R&B-tinged songs like “Hold On, We’re Going Home”, Drake has it within him the ability to be one of my favorite artists, though he is clearly more famous for other kinds of songs. This year he did it again, adding Caribbean flair with soft steel drums to “Passionfruit” while his voice carries the song and sets a distinct mood. 7. Violents & Monica Martin - "Unraveling"
Here’s the sad break-up song of the year. “Unraveling” is beautiful and heart-wrenching. It comes from a place of low lows, acknowledging when you’re falling apart. Best moment: the strings that come in around 3:30 and Martin delivers the line “I much prefer you the way that I found you”. 6. Marshall McLean - "Level Out"
Marshall brings Americana right out of Spokane, Washington. He hasn’t broken out yet, but do yourself a favor and check his music out. “Level Out” is his best work yet. The guitar work here is magical, from the lead to the steel guitar, and McLean’s distinctive voices offers a little bit of chill, “I’m just spinning my wheels, killing time until I feel, that the time is right for me to level out”. 5. Courtney Barnett & Kurt Vile - "Over Everything"
4. The War on Drugs - "In Chains"
The War on Drugs are the best band that you aren’t listening to, and with their latest album they drop a collection of songs that once again is the best of the year. The album’s most cathartic moments come from “In Chains”, a seven and half minute propulsive gem that, like much of their music, comes from a place of anxiety. But on “In Chains” that anxiety seems to break through and a concluding line like “We can try and learn to make it through/Then come out the other side” sound positively positive. 3. Sufjan Stevens, Bryce Dessner, Nico Muhly, & James McCallister - "Neptune"
If you, like me, are a sucker for Sufjan Stevens, don’t miss the top tracks from his somewhat bizarre collaboration album based around the planets in the solar system. But like every Sufjan album, no matter how odd or bloated, there is a moment that stops you in your tracks. For me that song is Neptune, a track that is as close to film score as a moving Sufjan piece, and the marriage of the two is breathtaking. 2. Coldplay - "All I Can Think About is You"
Despite the release of Coldplay’s completely average partnership with The Chainsmokers this year that moved the charts, Coldplay also released its best song in years and years on a little album called the Kaleidoscope EP. “All I Can Think About Is You” is a slow builder that breaks into a classic piano line then bursts forth with the best minute and a half of music this year. Rank this one amongst the very top songs they’ve ever written in their now lengthy and impressive career. 1. Iron & Wine - "Thomas County Law"
There is something about “Thomas County Law” that paints a picture and a feeling stronger than any song this year. It’s a song about a town, a home, and as Sam Beam says, “both denying and accepting one’s origins”. There are those who dream of leaving (“every dreamer falls asleep in their dancing shoes”), those who have been left behind (“there ain’t a mother with a heart less than black and blue”), and those who know they shouldn’t have left (“I may say I don’t belong here, but I know I do”). 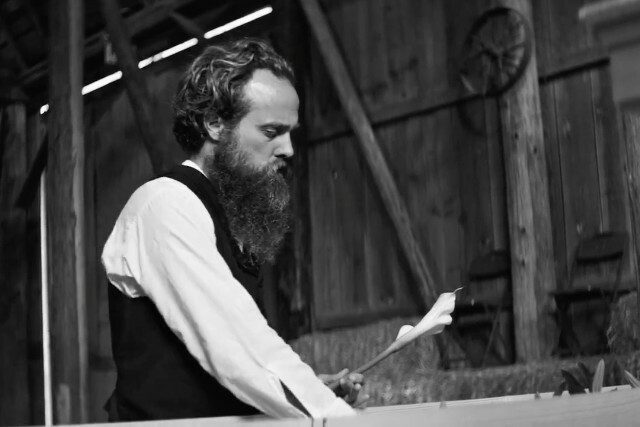 “Thomas County Law” is Sam Beam and Iron & Wine’s return to form, a step forward by taking a couple steps back. It’s lyrically perfect, musically stirring, and it’s the best track of the year.